The Cafe Guerbois was located in the heart of the Batignolles quarter. Many discussions about art took place there. 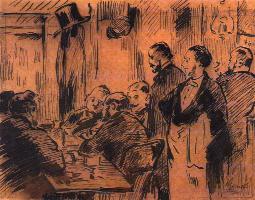 Most evenings, especially on Thursday, Manet's friends and admirers would gather to talk. His associates included Zola, Bazille, Duranty, Fantin-Latour, Degas, Monet, Renoir and Sisley. Sometimes Cezanne and Pissaro would show up. Manet did not like to be contradicted and one evening he fought a duel with Duranty. Duranty was wounded and later that evening they were friends again.